Landscape, painted on canvas in oil. The exact and deep image of the autumn nature in an oak grove. Levitan loved nature and in this picture revealed his love as fully as possible. The landscape depicts the trunks of oaks, picturesquely scattered around the entire picture. The crowns intertwine with each other, forming an autumn dome from foliage that is stunning with its brightness and richness of color. The trunks of trees are so realistic that you want to touch them. Thick, thin, curved, forked, even just hemp – everything the artist managed to fit and reflect in his picture. The entire space between the trees is covered with a carpet of lush and beautiful autumn foliage, which in some places is still arguing with summer green, which does not allow itself to be covered. A bright stripe along the entire landscape is the image of the path in the grove, located between the trees. It turns out a kind of alley in an oak grove. But most of all in the whole picture, its richness in color is striking. It so organically combines all the shades of autumn, that once again you are convinced of the beauty and charm of the Russian forest at this time of year. Meanwhile, the greenery is present in full. And the grass, and in some places the foliage is depicted by the artist still quite fresh and green, which gives a special color to the picture. Dark, almost black oak trunks merge with lush yellow-orange crowns into a single palette of autumn colors. Separate brushstrokes of burgundy and brown colors complement the overall color gamut. Looking at the picture, I want to close my eyes and breathe in the scent of an autumn oak grove. The fresh, stupefying smell of foliage as if through a picture sneaks right into a person, forcing him to find himself there, among beautiful oak trees. 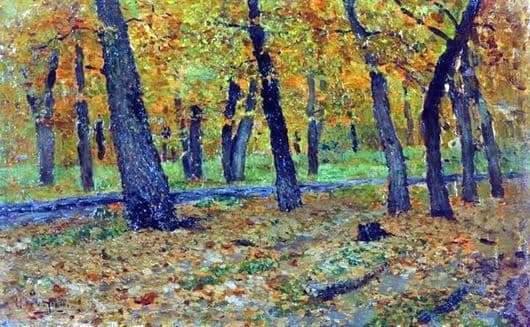 All the artist’s love for Russian nature, for its unique beauties is felt in every brushstroke, in every leaf and in every line.